The present Guide was created by the UIC Expert Group on Quality/Management Systems in order to assist UIC members, railway undertakings (RU) and infrastructure managers (IM) in the creation or revision of their safety management system (SMS). The introduction and implementation of an SMS provides the prerequisites for ensuring safe operations in the rail sector and for meeting the requirements of European and national legislation. Implementation of the Guide must respect the requirements of the responsible national safety authorities. This Guide is divided into three main parts. 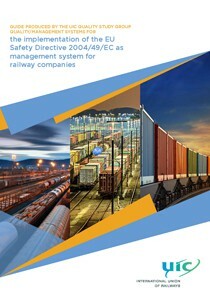 Firstly, Directive 2004/49/EC - and, more recently, the new Directive 2016/798 on railway safety (new edition) - make it an obligation for the RUs and IMs to establish and implement an operational safety management system and to prove their adherence to the applicable safety standards and rules. EU Regulation 1158/2010 defines the criteria for evaluating the safety certificates of the RUs, which are awarded upon the recipient providing proof of the introduction of a safety management system, etc. The same requirements apply to IMs in order to receive safety authorisation according to EU Regulation 1169/2010. All the requirements derived from these two legal texts are outlined in detail in point 3 "Guide according to EU Directive 2004/49/EC and EU Regulation 1158/2010 – 1169/2010” and in point 4 of the monitoring process in accordance with EU Regulation 1078/2012. In the fourth version of the Guide, the quality requirements of the new ISO 9001:2015 are brought in line with the requirements for an operational safety management system, explained by means of practical, user-friendly case studies. Interfaces with EU Regulation 445/2011 (ECM) are also illustrated. Directive 2016/798 has not yet been taken into consideration; however, due allowance must be made for the transitional provisions in place. Taking into account the different methods for implementing an SMS, the Project Group has prepared a Guide which is independent of any one management system, but does take into consideration existing management systems. The implementation recommendations produced are intended primarily for RU and IM operations. For improved understanding of the Guide, we recommend that interested readers carefully read point 2 "Usage instructions" before addressing the subject matter in greater depth. The revision is rounded off with case studies, suggestions concerning the safety management process, indicators, the management review and monitoring plan, and a new Appendix on ISO 9001:2015. If you have any questions or comments, you can contact the chairman of the UIC Quality Study Group and the project leader. Contact information is available from UIC.